There’s no denying that Baby Groot stole the show in Guardians of the Galaxy Vol. 2, but one of the sequel’s best surprises came when Adolescent Groot made an unexpected appearance in one of the five post-credit scenes. With four years set to pass between the events of Vol. 2 and Avengers: Infinity War, we probably won’t get to see Groot in that form again, but it’s going to be interesting to watch how the sentient tree develops from here, as there really are any number of directions that James Gunn can take the hero in. 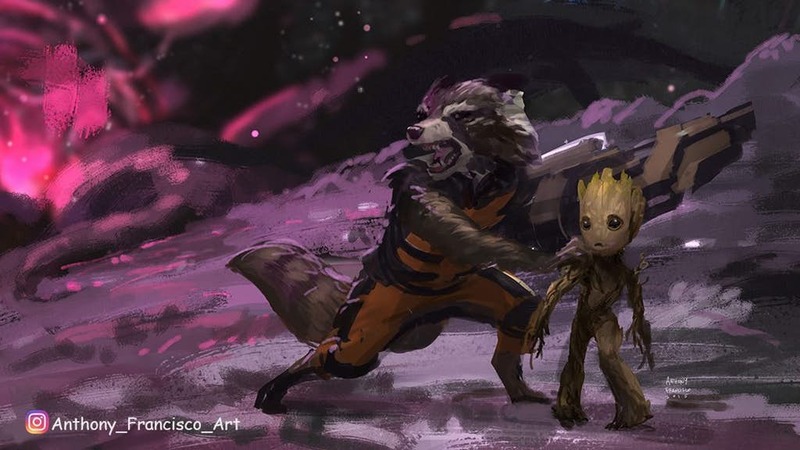 The design process for Groot in this movie is equally as fascinating, and that’s something made clear by Anthony Francisco, one of the designers at Marvel Studios Visual Development responsible for his new looks. It appears as if Baby Groot was originally envisioned as being the size of a human baby, something which would have definitely changed his dynamic in Guardians of the Galaxy Vol. 2 and possibly made him a whole lot less interesting and cute to watch. This version of the character has also been a big win for Marvel and Disney in terms of merchandising, as everything from plush toys to Funko Pops have been flying off the shelves as of late, so they definitely went in the right direction. Adolescent Groot wasn’t quite as cute, of course, but it’s fair to say that the character will still remain a firm fan-favourite regardless of what form he takes after Guardians of the Galaxy Vol. 2.